Our new “Beyond the Northeast” recruiting section debuts today. We start with a rising sophomore from California who just verbally committed to the University of Maryland. But Preston Faecher, a standout attackman at Redondo Union High School (Calif.) in Redondo, Calif., is not exactly unfamiliar with the Eastern seaboard. His father, after all, is a Maryland native and Faecher visits the Old Line State to see family at least annually. “I am familiar with the area and I love it,” he said. The Terrapins undoubtedly love that fact that the highly recruited Faecher has decided to join their program. The 5-foot-10, 165-pound Faecher is a versatile and skilled attackman who changes directions well and has outstanding field vision and a high lacrosse IQ, as evidenced by his highlight reel. He also plays football (as a quarterback and middle linebacker). Now, here’s a Q&A with Preston on his commitment. Well, my dad grew up in Maryland and I have family there, so I visit there at least once a year and I am familiar with the area and I love it. I was looking for a bigger rather than smaller school because I like the environment of a bigger school. Also, I think I fit the program well and I like the coaching style. Plus the perks of the uniforms, gear, etc. I was considering Hopkins and Denver. I visited Hopkins and talked with some coaches and it was great, but Maryland seemed like the better fit to me. I’d say I have a strong dodge. Though I’m not that fast, I have 3-4 quick steps and I change direction well. I have good vision and find my teammates well. I’d describe my style of play as a balanced. I can do everything pretty much the same as the other but I don’t do one thing exceptionally well. I can always improve my stick work, my shot, and my dodge, but I think I need to work on my speed. My dad and my aunt played from when they were kids through college. My aunt was actually and All-American in high school at Friends (School of Baltimore) and went on to play at Harvard. My dad got me playing in fifth grade and I didn’t play very much but the summer going into seventh grade I started to practice more and more, got better and better and now I can’t stop playing. I used to play basketball and baseball but now I just play lacrosse and football. I play for the West Coast Starz. We went to the NSCLA championship and took first place. I also went to the BlackCard Showcase and the Nike Blue BlueChip camp. I’d like to thank my dad for getting me into the sport and taking me to events and showcases to help me get better and get recruited. I’d also like to thank Scott Hochstadt. He was a huge help in getting me recruited and making me a better player. I looked up to Scott as I started playing and the next three years I have with him in his programs should be great. 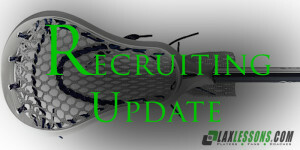 Have a recruiting commitment to report from anywhere in the lacrosse galaxy, from sea to shining sea and beyond? Email us at info@laxlessons.com or joe@laxlessons.com or send a Tweet to @Joe_Lombardi or @LaxLessons. I’m debating myself as to whether Florida or Cali will surprise Baltimore/Philly as #1 hotbed behind NY tristate within 1-2 years.